Finally a chocolate dessert that is so delicious, full of energy and so nutritional! 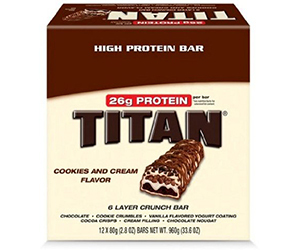 The Titan High Protein Bars will satisfy your hunger for hours, because they’re a great meal substitute. These power bars have only 5 or 6 gr of sugar and 26 gr of high quality protein, so they’re perfect for people who train regularly or for those who need a fast, but wholesome snack! Eat Titan bars and feel like a titan!